Did you know that something as simple as drinking tea or coffee can affect the colour of your teeth? But don’t worry there are ways we can help you restore your natural white smile! At DentalPlus we can offer you our Professional Tooth Whitening that will safely help you get a whiter, brighter smile. Patient G was very unhappy with her dark coloured teeth. 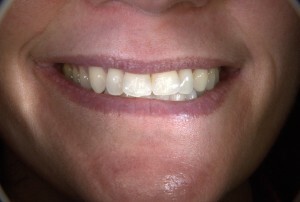 After 2 weeks of teeth whitening treatment the patient was extremely pleased with the results and felt she could smile with confidence again. Every one is different and very few people have brilliant-white teeth and our teeth darken as we get older. Teeth can also become stained on the surface with drinking tea, coffee and red wine. Professional Whitening is the most usual method of tooth whitening. Your dentist will be able to tell you if you are suitable for the treatment and supervise it if you are. The whitening gel is applied to your teeth using the trays which fit your mouth like a mouthguard. The active ingredient is 6% hydrogen peroxide. As the active ingredient is broken down, oxygen gets into the enamel on the tooth and the tooth colour is made lighter. The total treatment can usually be done in 3 to 4 weeks. You will require 2 to 3 visits to the dentist. 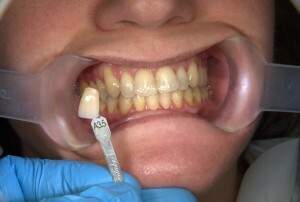 First your dental team will require impressions of your teeth to make specific whitening trays for your mouth. Once your dental team has started the treatment you will need to continue the treatment at home. This means regularly applying the whitening product 30 minutes per day over the next 2 to 4 weeks until a satisfactory shade is achieved. The effects of whitening varies from person to person. The effect is less likely to last as long if you smoke, or eat or drink products that can stain your teeth. Ask your dental team for their opinion before you start the treatment. Some people may find that their teeth become sensitive to cold during or after the treatment. These symptoms are usually temporary and should disappear within a few days of the treatment finishing. If the sensitivity continues make an appointment to see your dentist.